Hérisson is a delightful town located in the Allier department of the Auvergne region in central France. The river Aumance, a tributary of the Cher, flows through the town and eventually the Cher joins the River Loire and so to the Atlantic ocean. Dominating Hérisson are the castle ruins, visible from almost everywhere in town. Built by the Dukes of Bourbon in the 14th century to oversee river traffic, the castle was first taken by Louis XI in the 15th century, changed hands again in the 17th century before finally being dismantled by Cardinal Mazarin and converted to a stone quarry. At the time of our visit the castle was beginning to be restored but was still open to the public free of charge. Worth the climb to inspect the architectural detail and get some different views across town. Refurbishment is expected to be complete in about two years. The literal translation of Hérisson is hedgehog which accounts for the city crest shown here. The low key gift shop in town has all manner of hedgehog centric souvenirs including some fine ceramic pieces. 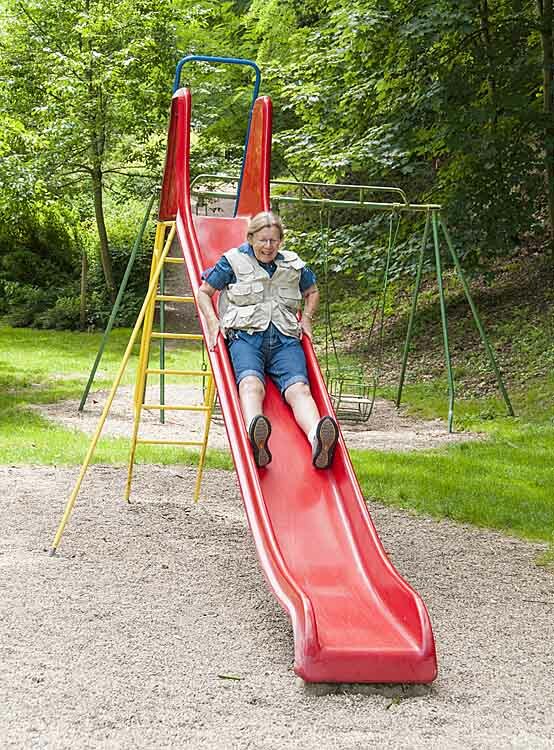 Check out these other pictures. Charroux is a fortified village of about 320 people in the Allier department of the Auvergne region in west central France. At 1360 feet altitude the village flourished in the renaissance period, led by its wine making and leather tanning industries. The Saint Jean Baptiste Church in the middle of the village has a curiously truncated bell tower although there is no explanation offered for the uniquely stubby steeple. 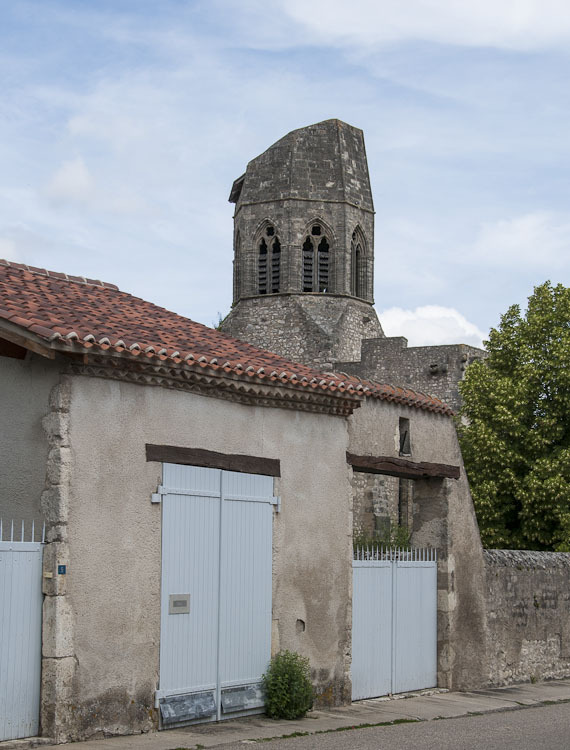 In 785 CE a Benedictine abbey was founded in Charroux by Roger, Count of Limoges. The abbey church was rebuilt in the 11th century to become one of the largest Romanesque churches in Christendom at 413 feet long. Following the death of Richard the Lionheart, King of England and Duke of Aquitaine in April 1199, the king's brain was buried at Charroux Abbey. In 1762 the abbey was abandoned and following the French Revolution the buildings were sold and were partly demolished to form a racecourse. 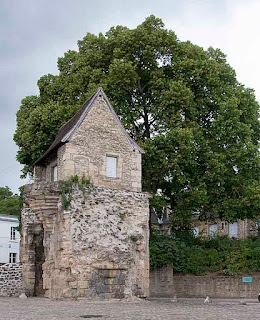 The only remaining structure of the church is the 11th-century lantern tower, known as the Charlemagne Tower. Pictures here. 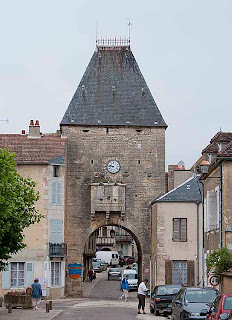 Nevers, a community in the Nièvre department of the Bourgogne region, first appears in written history as Noviodunum, which in 52 BCE, was upgraded to a depot by Julius Caesar. By the end of the 5th century it became the seat of a bishopric and the city later obtained charters in 1194 and in 1231. The most important religious building in the city is the Cathédrale of Saint Cyr-Sainte Julitte, dedicated to Saint Quiricus and Saint Julietta. The cathedral is actually a combination of two buildings, and possesses two apses - the apse and transept at the west end are the remains of a Romanesque church, while the nave and eastern apse are in the Gothic style and belong to the 14th century. Today, Nevers manufactures porcelain, agricultural implements, chemical manures, glue, boilers and iron goods, boots and shoes and fur garments, and has distilleries, tanneries and dye works - a really diverse range of light manufacture. More pictures. Our 2011 French tour was loosely based on a book called "The 100 most Beautiful Villages in France". The visit to Druyes-les-Belle-Fontaines had been a little unsettling in this regard since the book had completely missed the castle and its appurtenances - a key part of the experience. Sancerre too, was somewhat disappointing. True, it is old and has played a part in much European history but it is somewhat drab having endured a utilitarian makeover while the main square has been transformed into a curious sidewalk cafe-like dais. A natural 700 feet high fortress, Sancerre was a feudal possession of the Counts of Champagne who built a chateau on the hill in 1152 complete with ramparts to protect the city. The fortified city repelled the English forces twice during the Hundred Years' War but much of the surrounding area was destroyed by the forces of Edward, the Black Prince. A mansion in the style of Louis XII was built on the ruins of the original Chateau in 1874 by Mlle de Crussol d'Uzès which, during World War I, became the site of a military hospital. The population of Sancerre has declined steadily over the past two centuries, from 2500 in 1810 to less than 1700 today. More pictures and commentary here. From Clamecy it was but a pleasant 10 mile drive back into the Yonne department to the tiny community of Druyes-les-Belles-Fontaines. With a population of about 300, Druyes is about 600 feet above sea level and is actually two places - the village down by the river and the city around the castle on the hill.The suffix "les-Belles-Fontaines" refers to the springs that feed the river in the village. In the third century, St. Martin of Tours stopped by Druyes to convert the people who quickly returned to pagan worship after he left. It was not until the sixth century that St. Romain, a disciple of St. Benedict settled here in a cave and whose piety resulted in the creation of a monastery around 543. The Castle and surrounding city is a snapshot of the Middle Ages right in the heart of Burgundy. It was built in the second half of the twelfth century by the Count of Nevers and made famous by Peter of Courtenay and his daughter the Countess Mahaut. From the fourteenth century, Druyes went into decline. The castle passed successively through the hands of the Counts of Flanders, the Dukes of Burgundy, the family of Cleves House and Mantua. Finally, in 1735, the Duke of Nevers sold it to Louis Druyes Damascus , Marquis of Anlezy and the life of the Castle effectively ended. See more pictures of this unique community. Still in the Burgundy region we had traveled into the Nièvre department to stop at a small campsite by the Canal de Nivernais a mile or so outside of Clamecy. Documents from 634 CE refer to the settlement of Clamiciacus which then belonged to the bishops of Auxerre. During the Hundred Years War, Clamecy was sacked and then substantially rebuilt during the 14th century. In the 16th century it prospered as the origin of the 'Flottage du bois', by which lumber from the Morvan forests was floated down river to Paris, a process that continued until the 1923. Clamecy underwent a typical concentric French development cycle beginning with the 13th to 16th century core of remarkably intact houses surrounded by 19th century houses and buildings and fringed with 20th century developments forming an outer ring. The principal downtown building is the church of St Martin which dates progressively from the 13th, 14th and 15th centuries and was classified as a historic monument in 1840. The church was not open to the public. Once the site of saw-mills, boot and shoes factories and chemical production, most of which vanished in the first decades of the 20th century, Clamecy is now largely dependent on tourism, agriculture and the output of a few industrial units on the edge of town. Many of the declining population of 4,500 people commute to larger cities such as Auxerre and Paris for employment. More views here. 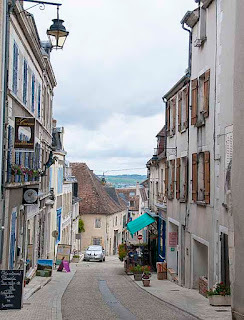 Yonne is a department of the Burgundy region of central France (somewhat akin to a County within a State in the USA) and Vézelay is a community of less than 500 people in the Yonne department. It is a highly defensible hilltop town and for this reason has been populated since ancient times. In the 9th century the Benedictines were given land to build a monastery and in the 11th century the current Basilica of St Magdelene was built. Both the town and the Basilica are UNESCO World Heritage sites and are a significant pilgrim destination as well as a major starting point for pilgrims on the Way of St. James to Santiago de Compostela in Spain. Bernard of Clairvaux preached the Second Crusade at Vézelay in 1146 and in 1189, the Frankish and English factions of the Third Crusade met at Vézelay before officially departing for the Holy Land. 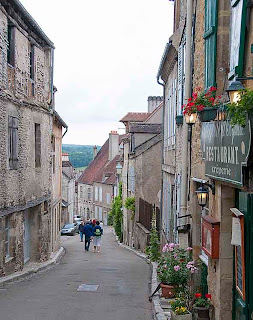 Vézelay is surrounded by vineyards and produce a range of mostly white wines, predominantly based on the Chardonnay, Pinot Noir and Melon de Bourgogne grape varieties. More pictures here. Noyers, or Noyers-sur-Serein as it is sometimes grandly called, is another "Udder" town almost completely enclosed by an udder shaped loop of the river Serein - a great defensive aid. 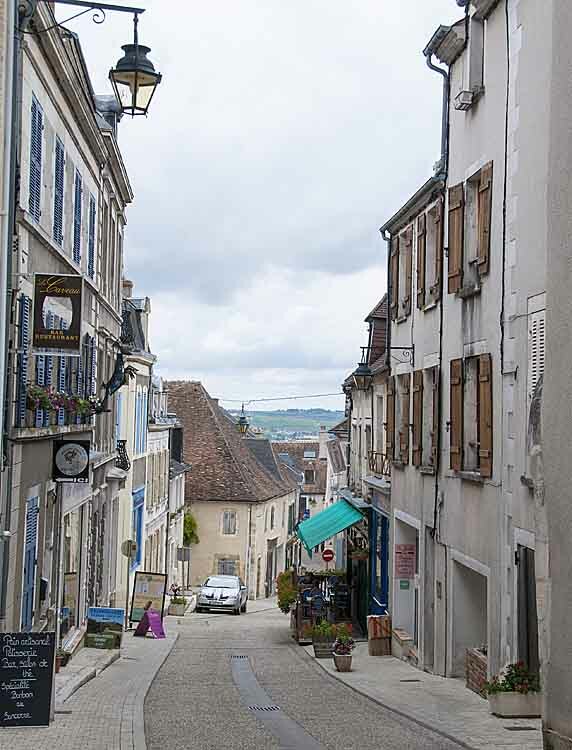 Home to around 750 people Noyers is in the Yonne department of the Burgundy region in north-central France. While the origins of Noyers are unclear the present name was certainly around at the end of the 12th century when Hugues de Noyers, bishop of Auxerre, built a massive fortified castle at the north end of town. The castle was beleaguered by Blanche de Castille’s troops in 1217 and resisted successfully surviving in fact until 1599 when King Henry IV finally dismantled it. Historically, wine and grain were the main products of the area supplemented by walnut and cherry trade. Agriculture remains the mainstay of the area with considerable consolidation of farms and much mechanization. 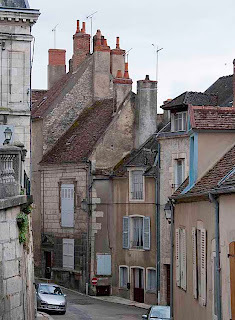 Pretty much a textbook north central France village - more pictures here. 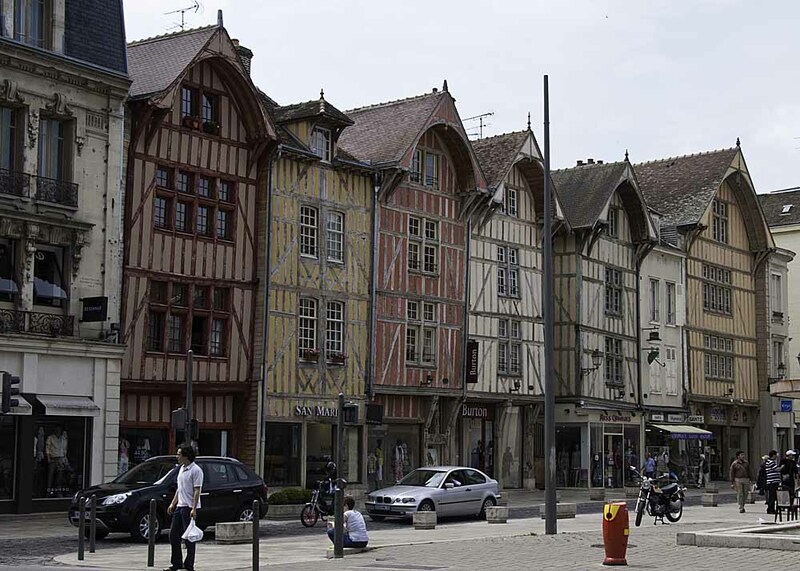 Located on the river Seine about 93 miles southeast of Paris and sporting numerous 16th century half-timbered houses, Troyes has been around since the Roman times. 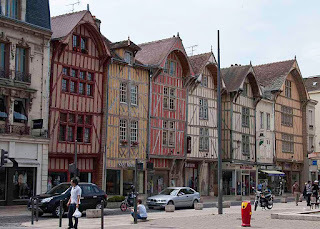 Known then as Augustobona Tricassium, Troyes is today the capital of the Aube department in north-central France and stands at the hub of highways leading to Reims, Langres (and eventually Milan), Poitiers, Autun and Orléans. Late in the Roman cycle the settlement atrophied and became known simply as Tricassae, the origin of French Troyes from the number three. Interesting illustrated history here. Louis the Stammerer received the imperial crown from the hands of Pope John VIII in 878 at Troyes and at the end of the ninth century the Counts of Champagne chose Troyes as their capital which it remained until the Revolution. During the Middle Ages, it was an important trading town and the concept of troy weight used today in gold trading was born here. Click for more pictures. After picking up our little camper van, Penny Pilote, in Numansdorp, NL, we usually raid the local grocery store and then go hell for leather out of Holland, across Belgium to reach the tranquility and relative normalcy of northern France. This trip was no exception - provisioned up at Albert Heins and a few hours of forgettable freeway behind us, we arrived at La Paille Haute (The High Straw) in Boiry Notre Dame by mid-afternoon. Boiry-Notre-Dame is a tiny town in the Pas-de Calais Department of the Nord-Pas-de-Calais region. At an altitude of about 270 feet and occupying less than 2.5 square miles, it is home to a little over 400 souls. 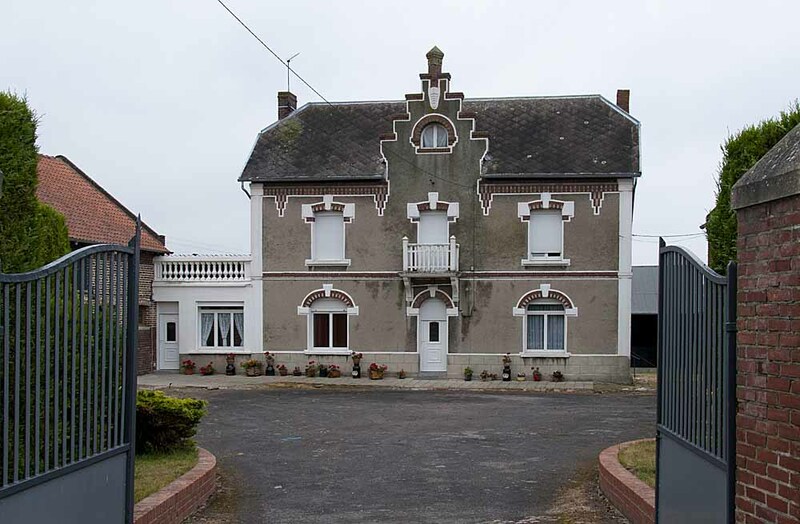 This quiet farming village is about 10 miles southeast of Arras, has a school, a Marie (Mayor's place), a church and a memorial to yet more glorious dead. 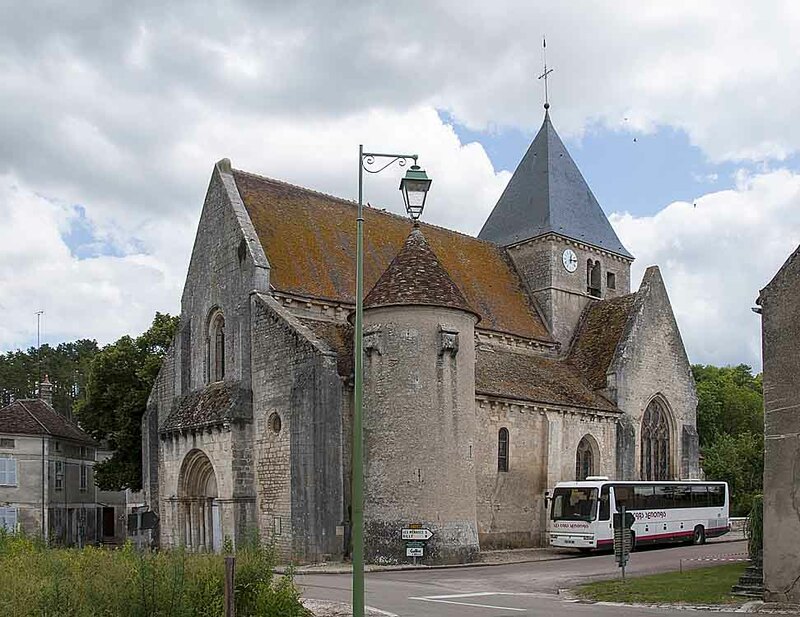 The church of St.Vaast was rebuilt in the 1920's after being destroyed in WWI. Click here for more pictures.